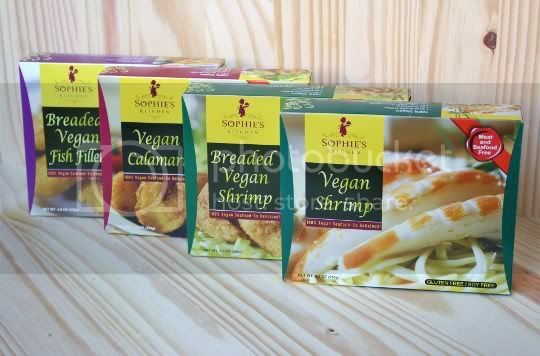 Available at most Whole Foods or natural grocery stores, Sophie's Kitchen offers almost every seafood substitute under the sun...er, sea. They're great for eating on their own (with your favorite dipping sauce), or for using to veganize recipes. The main ingredient in most of the products is elephant yam root (aka konjac), which has a texture similar to gelatin or those oh-so-popular tofu shiritaki noodles. Other ingredients include potato starch, agave nectar, and seaweed. I know you're thinking horrible things at this point, but trust me...the stuff is GOOD. These cute little patties have a slightly sweet, fishy flavor, and there's plenty of well seasoned, crispy breading surrounding them. The texture isn't exactly fishy; it's more like faux chicken. A little stringy, dense, and mushy (they're made with TVP), not flaky and light like I'd expect. Still, they're delicious. I think they're best served in place of fish for a sandwich, and they're great with a little Vegenaise-based tartar sauce. 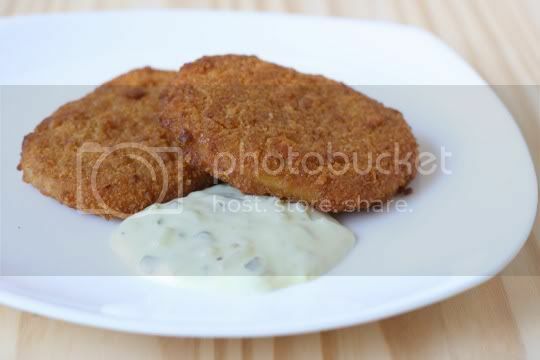 In fact, the tartar sauce definitely ups the seafood flavor. 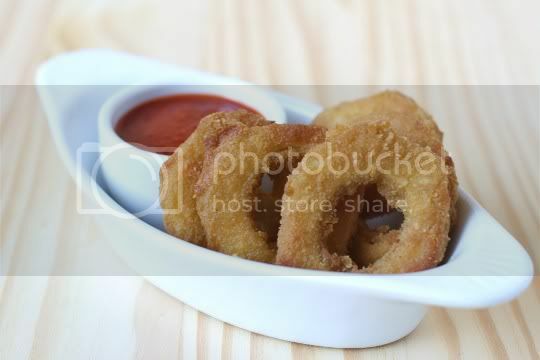 So, I've never actually had real calamari, as the idea of eating something like that always grossed me out. But whatever these things are? Superb! 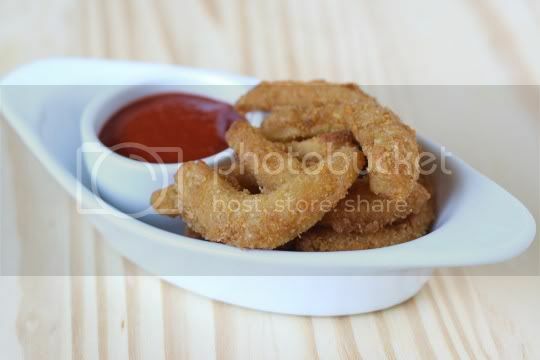 The actual "calamari" is white, chewy, and a bit tough, but the REAL flavor is in the breading. Peppery, perfectly coated, and crispy, it's what makes this little guys so addictive. I'm not sure if it's the breading or the calamari, but something in this definitely has a seafoody taste. And they're so simple! Just lay them on a baking sheet and bake for about 20-30 minutes (or until your level of crispiness is achieved). Serve them up with your favorite seafood dipping sauce; cocktail sauce (pictured) is a favorite of mine. 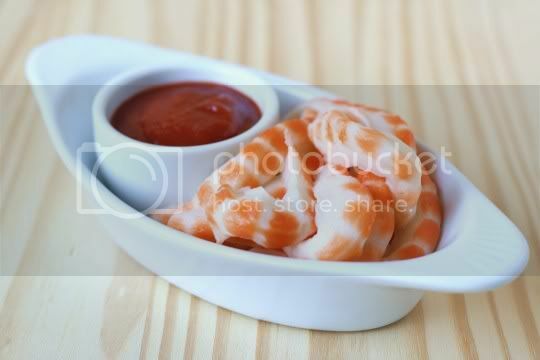 You definitely won't be fooling anyone into thinking these are real shrimp, but with the right sauce or condiment, they work wonders. I consider these to be in the realm of tofu: pretty much flavorless, until they're coated or doused in a super flavorful sauce. But perhaps the strangest thing about these shrimp is the texture: rubbery, chewy, and jiggly (yes, they jiggle). It's a strange thing to get used to, but once you do, the sky for veganizing recipes is the limit. Last but not least, my absolute favorite of the bunch. The strange jiggly shrimp texture is completely masked by the delicious, crispy, perfectly seasoned breading. These things are addictive, the perfect party finger food. They are simply divine dipped in cocktail sauce, but I bet a nice spicy citrus sauce would do equally well. If you're not careful, you can easily eat an entire box of these. These little babies have become a permanent part of my frozen foods rotation. It's nice to know that great-tasting, healthy vegan seafood alternatives are widely available, and at decent prices too (compared to the real stuff!). Word on the street is Sophie's Kitchen is even coming out with crab cakes and breaded scallops! I can't wait to update this post with those treats! thanks for sharing this...I will definitely check this product out...what's the sodium level like? Pretty low! Only about 6-10% of the RDV. Check out the website for nutrition info for each product. I tried the Vegan breaded shrimp last week, and really liked them. The texture is really close to seafood with that awkward "soft/ crunchy" shrimp texture. It definitely didn't taste "fishy," but it was pretty fantastic. Ive seen these at a market before but was a little iffy on trying them. Iam going to give them a try soon. @Shoshana Good to know that it has a very low sodium content. I am planning to set up a party for my vegan friends and I will take these into my list. Thanks! Tried the vegan prawns last night. We both thought they were terrible, and even our vegan poodle - who loves vegetables in all forms - wouldn't eat them. He actually carried them around like a chew toy for awhile, and then left them! They were flavorless, and had a very weird, rubbery texture. I put them in a very flavorful, coconut milk curry with lots of onions, peppers and spices, but it didn't help at all. Earth Balance, garlic powder, & black lava salt work wonders on the unbraded vegan shrimp ...microwaved! delicious & taste/texture like the real deal! I'm not vegan...yet...but I tried the crab cakes and they are sooooo delicious! I am new to the Vegetarian, Vegan market. I still crave certain meat products and seafood along with hot dogs are one of them. The Breaded Shrimp is absolutely WONDERFUL..tastes just like shrimp. I use it with cocktail and tartar sauce on the side..I use it as a sweet and sour stirfry. Whatever you use breaded shrimp for, this is the ticket. would love to try the scallops and fish too. Now if I can taste something similar to a hot dog, I will be fine. cheers! try morningstar farms veggie dogs ~(frozen~) or litelife smart dogs...cook as directed then put under broiler a minute or two. also morningstar vegan riblets are very good. check out fakemeats.com, or vegefood store online.